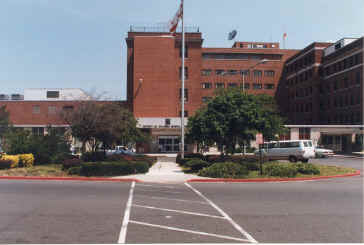 April 24, 2001, the Mayors Official Residence Commission, headed by former Mayor Walter Washington, reports that the proposed mansion on the 16.5 acre site will have little impact on the adjacent neighborhood, provides sufficient parking, and accommodates all reasonable security concerns. June 5, 2001, by resolution, the D.C. Council tentatively accepts the “gift” offer. June 13, 2002, the National Park Service and the Casey Mansion Foundation agree to exchange four acres of Park-Service-owned wooded parkland adjacent to the Mansion site for two parcels of Casey-owned land on the Georgetown waterfront. Although no architectural design has been published, the Casey Foundation claims the additional four acres is required for a service and parking entrance to the Mansion, improved security, and a more attractive view. The NPS has placed covenants on the land transfer to prevent future development. In response to public pressure, the NPS has agreed to set up an escrow account to exercise its right of first refusal to repurchase the Whitehaven Parkland if the mayoral residence is not built. September 17, 2002, FCCA establishes committee to review the NPS land transfer. The Casey Mansion Committee (CMC) voted unanimously (12-0) to oppose the transfer. The FCCA Executive Board voted unanimously (8-0) to oppose the transfer. November 20, 2002, FCCA membership voted unanimously (37-0) to oppose the transfer. December 4, 2002, ANC3-D (Palisade) unanimously passed a motion to “oppose” the transfer. December 3, 2002, ANC2-E (Georgetown) unanimously passed a motion to "not support" the transfer. Who needs it? The CMF has not demonstrated a need for the additional four acres. D.C. acknowledges the original site meets all of its requirements. Public access to Public parkland. The CMF would fence the property eliminating all public access. NPS stewardship is better. The transfer opens the Mansion site, the parkland, and adjacent privately owned property, a total of 35 acres, to potential dense development should the Mayor’s mansion not be built? A Threat of Development. The CMF has refused to draw up a legal agreement making the mansion available to the District until after the mansion is built, yet still reserves the right to develop as a matter of right up to 144 houses on the mansion site. Adverse Environmental Impact to wildlife and wetlands. The Whitehaven Parkland serves an important hydrologic function, filtering pollutants and sediments entering the wetlands and Glover Archbold Park. The CMF plans to remove the understory growth, which would increase runoff and sediments, and reduce the filtering of pollutants. NPS escrow fund may not be sufficient to reacquire parkland at market value and might be better used to simply purchase the Georgetown waterfront parcels. NPS covenants only protect the parkland if they are enforced. Examples exist of covenants not enforced and eventually being removed. Sign the CMC Petition. The results of will be presented to D.C. government officials, Federal officials at the NCPC and NPS, Congressional representatives, and to the media. Visit the Whitehaven Parkland site. Attend meetings of the CMC every Saturday at 10:00 a.m. at the Palisades Public Library. Write letters to the National Park Service, National Capital Planning Commission, District Government, and to newspapers (Washington Post, Washington Times, The Current). FCCA Position Statement: Casey Mansion Committee Update, Howard Bray, Nov 7, 2002. Mayoral Mansion Plans Imperil Wild Slice of D.C., David Nakamura, November 25, 2002, p A01. Land swap stirs worries over ecology, Christen Aragoni, Nov 6, 2002, p 1. Land-swap architects scrap trail proposal, Chris Kain and Christen Aragoni, Oct 9, 2002. Residents Protest Plans For Mayor’s Mansion, Bruce Johnson, Nov 25, 2002. Neighbors Try To Keep Park Away From Mayor, Tom Sherwood, Nov 25, 2002.